The first rudiment of the future central nervous system appears on the 15th day of gestation, when the primitive streak is formed on the surface of the bilaminar embryo; proliferating cells at its cranial end form the Hensen’s node and subsequently migrate in the ectoderm–endoderm interface to form the intervening mesoderm, in a process called gastrulation. Specialized paired columns of migrating cells integrate along the mid-line to form the notochord, that induces the formation of the overlying neuroectoderm of the neural plate. The progressive thickening and infolding of the neural plate forms the neural groove, whose lips will fuse along the mid-line to form the neural tube. This process is called primary neurulation, and is traditionally conceived as beginning at about 20 days at level of somite 4 (future craniocervical junction) and proceeding bidirectionally in a zipper-like fashion, with the cranial end (anterior neuropore) closing at 25 days and the caudal end (posterior neuropore) at 26–28 days15. The cavity of the neural tube at the anterior neuropore progressively dilates into three primitive brain vesicles: prosencephalon, mesencephalon and rhombencephalon. Subsequently, the prosencephalon divides into the telencephalon (future cerebral hemispheres, caudate nuclei and putamina) and diencephalon (future thalami, hypothalamus and globi pallidi), and the rhombencephalon into the metencephalon (future pons and cerebellum) and myelencephalon (future medulla oblongata); the mesencephalon (future cerebral peduncles and quadrigeminal plate) remains undivided. 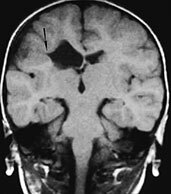 Causes of brain malformations belong to four main categories: chromosomal aberrations, single gene mutations, extrinsic teratogens, and unknown. The latter category is the largest, accounting for as many as 75% of all malformations at term15. The process of infolding of the neural plate to form the neural tube (primary neurulation) characterizes the 4th gestational week. As previously stated, primary neurulation is traditionally believed to occur in a zipper-like fashion starting from the region of somite 4 and proceeding bidirectionally. However, recent evidence suggests that the neural tube starts closing simultaneously at five separate closure sites21. This concept is intriguing as (i) it points to the segmental nature of early embryonic development, and (ii) it explains why neural tube closure defects occur preferentially in certain sites, such as lumbosacral myelomeningoceles or occipito-cervical, occipital, frontal, and skull base cephaloceles. Probably, the interface between two adjacent closure sites is a sort of ‘watershed’; that is, an intrinsically weaker area where closure defects are more likely to occur. As a consequence, cephaloceles and open spinal dysraphisms (prevailingly myelomeningoceles) may be schematically conceived as a single developmental disorder, with the main difference being the segmental location of the defect along the longitudinal embryonic axis. However, due to the need for uniform terminology, the separation between cephaloceles and the intracranial counterpart of myelomeningoceles (i.e. the Chiari II malformation) is preserved in this chapter. The intermediate form between these two entities (i.e. the Chiari III malformation) is also discussed separately. 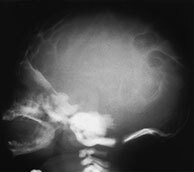 Cephaloceles are characterized by a protrusion of cerebral and/or meningeal tissue through a congenital defect of the skull and dura, usually located at or near the mid-line. In Western populations, most cephaloceles are occipital in location. Although the diagnosis is usually made antenatally by means of ultrasound, magnetic resonance (MR) is used to assess the contents of the herniated sac; on this basis, five groups may be identified (Table 11.1)14, 17, 18, 20The skin and dura overlying the malformation may be incompletely formed, so that in some cases the arachnoid layer is directly exposed and may become infected and ulcerated. MR (Fig. 11.1) provides a reliable depiction of the malformation, suggests its categorization according to the location (Table 11.2), and recognizes associated findings such as hydrocephalus, commissural anomalies and the Chiari II malformation; the association of the latter with an occipito-cervical cephalocele is termed Chiari III malformation (Fig. 11.2)17, 18, 20. MR angiography detects blood vessels such as dural sinuses within the herniated sac, which may be responsible for major bleeding during surgery. Fig. 11.1 Nasofrontal (glabellar) meningoencephalocystocele, 3-month-old baby. 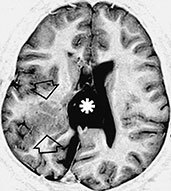 (a) Photograph of the patient; (b,c) MR at 0.5 T; (b) sagittal spin echo (SE) T1 weighted image, 500/20/2, repetition time/echo time/acquisitions; (c) axial MR T1 weighted image, 500/20/2. In this particular case, the cephalocele is associated with alobar holoprosencephaly. 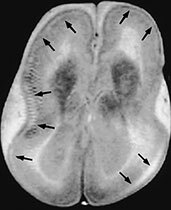 Notice the partially trapped right frontal horn within the cephalocele (arrow, (b,c). 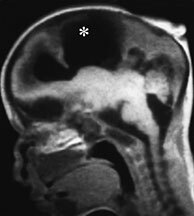 There is concurrent cystic malformation in the posterior fossa whose precise attribution is difficult due to extreme distortion of the anatomical structures. Fig. 11.2 Chiari III malformation, 3-day-old newborn. (a) Photograph of the patient at 8 months; (b–d) MR at 0.5 T; (b) sagittal SE T1 weighted image, 500/20/2; (c,d) axial SE T1 weighted images, 500/20/2. The herniated sac protrudes through a wide occipito-cervico-thoracic schisis, and contains the cerebellum, occipital lobes and ventricular trigones (b–d). Associated Chiari II signs are present, i.e. 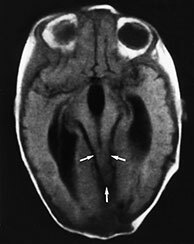 low-lying brain stem, thickened interthalamic mass (asterisk, b), and tectal beak (arrow, b). 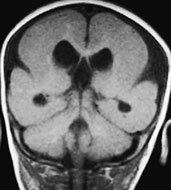 Associated abnormalities in this particular case comprise callosal dysgenesis (arrowhead, b) and Dandy–Walker malformation. There is always a 1:1 association between an open spinal dysraphism (usually a lumbosacral myelomeningocele) (Fig. 11.3) and the Chiari II malformation, a complex congenital anomaly of the hindbrain characterized by caudal displacement of the vermis, brain stem and fourth ventricle. 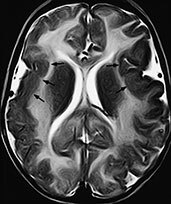 It should be noted that such association is consistently present; that is, all neonates with myelomeningocele also harbor a Chiari II malformation. 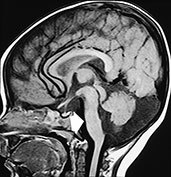 However, the severity of the hindbrain malformation may be variable, so that patients with a nearly normal-sized posterior fossa may sometimes be found; subtle, minimal features of Chiari II malformation should therefore be actively sought in all newborns with open spinal dysraphisms. The original defect occurs in the phase of primary neurulation, and probably involves the interface between two adjacent neural tube closure sites, more frequently between sites 1 and 5 in the lumbosacral spine; at this level, the neuroectoderm is ‘frozen’ at a neural plate stage (placode). CSF leaks through the defect into the amniotic sac, resulting in chronic CSF hypotension within the developing neural tube, insufficient dilatation of the rhombencephalic vesicle (future fourth ventricle), and lack of induction of the perineural mesenchyma of the posterior cranial fossa11. Therefore, both cerebellum and brain stem are eventually forced to develop within a smaller than normal posterior fossa, and consequently herniate through both the tentorial groove and the foramen magnum. CSF hypotension in the supratentorial brain may also impair neuronal migration and bony development, producing various associated malformations of the nervous tissue and osteomeningeal covering. All infratentorial anomalies detected by MR (Fig. 11.3) 12, 17, 18, 20are generated by the lack of vital space for the cerebellum and brain stem into a smaller than normal posterior fossa. The inferior vermis herniates into the foramen magnum and wraps around the posterior surface of the cord (cerebellar peg). The medulla is stretched downwards into the foramen magnum while the cervical cord is anchored by the dentate ligaments, resulting in the cervicomedullary kink, best seen on sagittal views. The cerebellar hemispheres tend to engulf the brain stem, occupying the pontocerebellar angles. The cerebellum may also herniate upwards through the tentorial hiatus (towering cerebellum). The fourth ventricle is usually small or even completely effaced17, 18, 20The inferior colliculi may be hypertrophied or fused, and point posteriorly to form the tectal beak. 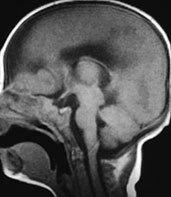 Hydrocephalus is a consistent finding in newborns within 48–72h of repair of the spinal dysraphism, and is usually the first occasion for the neuroradiologist to see these patients, as MR is only rarely performed before surgery. The suprapineal recess of the third ventricle and the interthalamic mass are especially prominent. 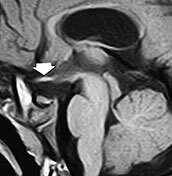 Crowding of histologically normal cerebral convolutions in the parieto-occipital regions is known as stenogyria. Commissural (callosal) anomalies are commonly associated. Disorganization of the collagenous outer meninges from which the membranous calvarium forms produces irregularity of the surfaces of the inner and outer table of the skull; this feature, known as lacunar skull or luckenschädel (Fig. 11.3), was of diagnostic importance in the pre-MR era. Fig. 11.3 Chiari II malformation. (a–c) 12-h-old newborn with thoracolumbar myelomeningocele; (d–f) 8-h-old newborn with sacral myelomeningocele. (a) Photograph of the patient; (b) plain X-ray radiograph, lateral view; (c) axial CT scan; (d–f) MR at 0.5 T; (d) sagittal SE T1 weighted image, 500/20/2; (e,f) axial SE T1 weighted images, 500/20/2. 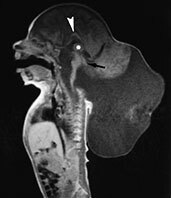 (a) This newborn has a large thoracolumbar myelomeningocele. The wide placode (arrowheads, a) is exposed to air and surrounded by a partially epithelized area (asterisks, a) and, more laterally, by intact skin (arrows, a). 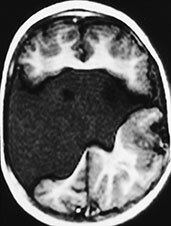 Dilatation of the underlying subarachnoid spaces produces the swollen appearance of the malformation. CSF leaks from the spinal canal at the cranial end of the placode (empty arrow, a). 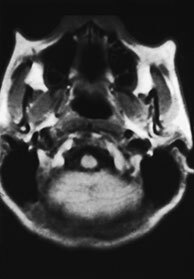 Skull X-rays (b) show multiple focal areas of radiolucency, consistent with lacunar skull. Notice the typical conformation of the skull in a Chiari II patient, with a shallow posterior fossa. On CT (c), these lacunae are more clearly visible. 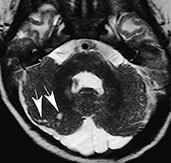 In a different patient, the mid-sagittal MR image clearly shows the cerebellar peg (thick white arrow, d) and the cervicomedullary kink (black arrow, d), forming the typical cascade of herniations. The fourth ventricle is small (white arrowhead, d). 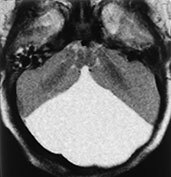 The inferior quadrigeminal tubercles are thickened, although a typical tectal beak is not clearly visible in this particular case (thin white arrow, d). The apparently independent (‘accessory’) lobe visible right above the vermis (black arrowhead, d) is in fact the stretched medial surface of the temporal lobe. 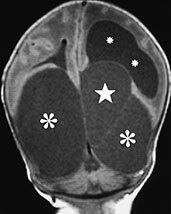 The suprapineal recess of the third ventricle is widened (starlet, d) and the interthalamic mass is thickened (asterisk, d). Axial views show a smaller than normal posterior fossa with a small fourth ventricle (arrowhead, e) and hydrocephalus (f). Mid-line telencephalic commissures are represented by the corpus callosum, hippocampal commissure and anterior commissure. The corpus callosum is the largest commissure in the brain, and is anatomically divided in four portions from anterior to posterior: the rostrum, genu, body and splenium. The hippocampal commissure or psalterium Davidi connects the posterior pillars of the fornix and lies along the inferior aspect of the posterior callosal body and splenium, so that the term ‘calloso-hippocampal commissure’ has been introduced to illustrate such continuity16. The anterior commissure crosses the mid-line at the superior end of the lamina terminalis. Embryologically, the telencephalic commissures derive from the lamina reuniens, a dorsal thickening of the embryonic lamina terminalis. The recent concept that callosal development starts from the posterior portion of the genu and proceeds bidirectionally towards the splenium and rostrum has been questioned by Raybaud and Girard16, who introduced a new classification of the abnormalities traditionally known as ‘agenesis and hypoplasia of the corpus callosum’, a simplified version of which is presented here (Table 11.3). 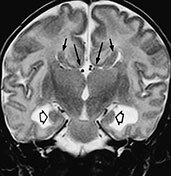 Former callosal (now commissural) agenesis may be categorized into three subsets: complete commissural agenesis, calloso-hippocampal agenesis, and isolated callosal agenesis. 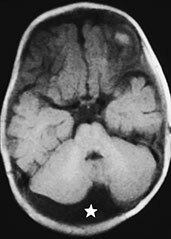 The most frequent among the three is calloso-hippocampal agenesis, in which the anterior commissure is preserved, and is sometimes hypertrophied; this variety represents the classical, widely described callosal agenesis. Calloso-hippocampal agenesis is characterized by a host of MR features, first and foremost the absent visualization of the corpus callosum and fornix in mid-sagittal scans (Fig. 11.4)17, 18, 20Developing axons fail to cross the mid-line and remain in their native hemisphere, forming the so-called longitudinal callosal bundles of Probst. These run along the medial walls of the lateral ventricles, characteristically resulting in crescentic-shaped frontal horns in coronal sections. Because the cingulus (forming the white matter core of the cingulate gyrus) is consistently absent, the cingulate gyrus does not fold16, the calloso-marginal sulcus does not form and the mesial cortical sulci show a radial arrangement; the evaluation of the calloso-marginal sulcus is especially useful in the neonate to assess callosal morphology indirectly, as absent or incomplete myelination results in physiologic isointensity of the corpus callosum with brain in the newborn. Moreover, absence of the cingulus produces thinning of the parahippocampal convolutions, leading to dilatation of the temporal horns and rudimentary hippocampal infolding16. Hypoplasia of occipital associative bundles allows dilatation of trigones of the lateral ventricles (colpocephaly)16. The rarer complete commissural agenesis and isolated callosal agenesis differ only in that the anterior commissure is hypoplastic and the psalterium is visible in mid-sagittal scans, respectively. 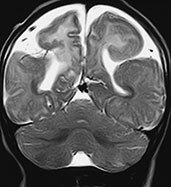 Other than being frequently associated with other congenital brain abnormalities, calloso-hippocampal agenesis is consistently present in Aicardi syndrome. This entity has dominant X-linked transmission and is characterized by cortical dysplasia, chorioretinic lacunae, coloboma, cerebellar malformations, choroid plexus papillomas and holoprosencephaly. Fig. 11.4 Calloso-hippocampal agenesis, 23-day-old patient. MR at 1.5 T. (a). Sagittal SE T1 weighted image, 600/20/2; (b) axial SE T1 weighted image, 614/20/2; (c) axial FSE T2 weighted image, 5000/112/4; (d) coronal FSE T2 weighted image, 5000/112/4. The corpus callosum and fornix are completely absent, resulting in the typical spokewheel-like arrangement of the mesial cortical sulci (a). 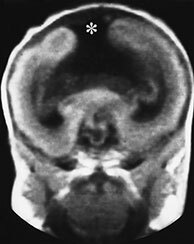 Notice physiologically hyperintense pituitary gland in this newborn (arrow, a). 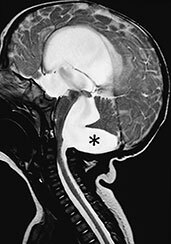 Dilatation of the posterior portions of the lateral ventricle is called colpocephaly (b). On axial views, the longitudinal callosal bundles of Probst are visible along the medial walls of the lateral ventricles (arrows, c); the latter course parallel to the falx cerebri and the interhemispheric fissure. 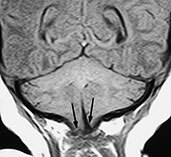 On coronal views, the frontal horns are crescentic due to the presence of the bundles of Probst along their medial walls (short arrows, d). Notice everted cyngulate gyri (long arrows, d) without formation of the callosomarginal sulci. Both hippocampi are rudimentary (empty arrows, d). According to the new classification, callosal hypoplasia may in fact be divided into three categories: partial posterior commissural agenesis, diffuse commissural hypoplasia and segmental callosal hypoplasia. Partial posterior commissural agenesis is characterized by partial agenesis of the posterior portion of the corpus callosum; the extent of the agenetic portion may be variable, with only part of the genu (corresponding to the portion of the corpus callosum which forms first) present in the most severe cases, and is predictable based on the traditional theory of bidirectional development of the corpus callosum. Diffuse commissural hypoplasia, characterized by diffuse thinning of the three commissures, could be related to errors occurring later during commissural plate development resulting in a lesser amount of fibers crossing the commissures. 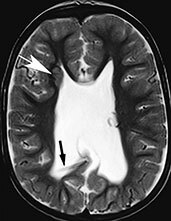 There is no widespread consensus as to whether segmental callosal hypoplasia, in which an intermediate portion of the corpus callosum is thinned, exists as a developmental abnormality, most cases being represented by secondary callosal destruction or resulting from white matter atrophy. 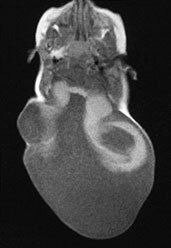 CSF-filled cavities associated with commissural abnormalities belong to two main categories: diencephalic pseudocysts, representing superior bulging of the tela choroidea of the third ventricle, and interhemispheric cysts, which are independent from the ventricles and may in turn be intraparenchymal, subarachnoid, arachnoid, or even intradural. 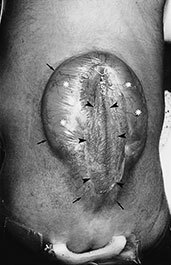 True interhemispheric cysts suggest that commissural development may influence, and in turn be influenced by, development of the meninx primitiva; this may also explain the high incidence of interhemispheric (so-called ‘callosal’) lipomas with commissural abnormalities (see below). 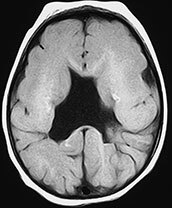 This term refers to a complex developmental anomaly of the brain and skull, characterized by hypoplasia of the most rostral portions of the neural tube, resulting in fused cerebral hemispheres and absence of mid-line structures such as the rhinencephalon, corpus callosum and septum pellucidum. Both genetic factors (either chromosomal aberrations or single-gene mutations) and extrinsic teratogens may be involved in the pathogenesis15. The frequent association with neural tube closure defects suggests a common cellular disorder, possibly related to defective embryonic axial patterning and segmentation. Holoprosencephaly is classically divided into alobar, semilobar and lobar types according to the severity of the malformation. However, a precise boundary among the three groups does not exist and intermediate cases may be identified17, 18.2. Mid-line structures such as the falx cerebri, superior sagittal sinus, interhemispheric fissure, septum pellucidum, corpus callosum, third ventricle, pituitary gland and olfactory bulbs are absent. The thalami are fused and abut a rudimentary ventricle freely communicating with a large cyst, the dorsal sac, extending upwards to the calvarium. Posterior fossa malformations and neuronal migration anomalies may be associated. The diagnosis is usually made antenatally by ultrasounds. Neonates are usually stillborn and are therefore rarely imaged by MR. Fig. 11.5 Alobar holoprosencephaly, cebocephalic stillborn. (a) Photograph of the stillborn. (b-e) MR at 0.5 T; (b) axial SE T1 weighted image, 500/20/2; (c,d) coronal SE T1 weighted images, 500/20/2; (e) sagittal SE T1 weighted image, 500/20/2. The thalami are fused in the mid-line (b,c) and there is a crescentic holoventricle which communicates with a large dorsal sac (asterisk, d,e). There is associated Dandy-Walker variant (e). The brain is less dysmorphic; rudimentary lateral ventricles are present and the cortex is more developed. The thalami may be partially separated and a rudimentary third ventricle may be seen. The interhemispheric fissure and the falx cerebri are partially developed posteriorly, whereas the frontal lobes are fused. The corpus callosum is absent in the fused regions, whereas a pseudosplenium is visible where the two cerebral hemispheres are separated17, 18, 20The differentiation from the most severe alobar variant is usually easy by MR, and is based on the detection of the posterior part of the falx and interhemispheric fissure. Fig. 11.6 Semilobar holoprosencephaly. (a) Anatomic specimen, coronal plane. There is complete fusion of the two hemispheres with absence of the interhemispheric fissure and corpus callosum. Temporal and occipital horns of the lateral ventricles are rudimentary. (b–d) MR at 0.5 T; (b) axial SE T1 weighted image, 500/20/2; (c) coronal SE T1 weighted image, 500/20/2; (d) sagittal SE T1 weighted image, 500/20/2. There is a single ventricular cavity with rudimentary trigones and temporal horns (b,c). There is a concurrent small dorsal sac in this particular case (asterisk, b). There is absence of an interhemispheric fissure anteriorly with fusion of the two cerebral hemispheres. A rudimentary third ventricle separates the thalami. There is associated Dandy–Walker variant (d). This is the mildest form, usually found in asymptomatic or mildly retarded individuals. 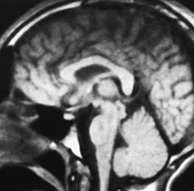 The lateral ventricles are formed; the frontal lobes may be partially fused in some cases and separated in others, but the septum pellucidum is constantly absent. The mildest forms show only the absence of the septum pellucidum, and therefore require differentiation from septo-optic dysplasia, in which, however, optic nerves are constantly hypoplastic. The differentiation from the semilobar variant is sometimes difficult by MR due to the large number of intermediate forms; the degree of anterior extension of the corpus callosum in mid-sagittal planes may be used as an indicator of the severity of the malformation. Fig. 11.7 Lobar holoprosencephaly, 14-month-old infant. MR at 1.5 T. (a) Axial MR FSE inversion recovery (IR) image, 8024/80/2 with 150ms inversion time (TI); (b) sagittal SE T1 weighted image, 500/16/2; (c) 3D TOF MR angiography, 39/7.3/1 with 20_ flip angle, axial reconstruction. There is fusion of the basal portions of the frontal lobes across the mid-line (asterisk, a,b). The septum pellucidum is absent and the shape of the lateral ventricles is rudimentary. In a mid-sagittal plane, the anterior edge of the corpus callosum (arrow, b) is an indicator of the degree of separation of the two cerebral hemispheres, and can be used to grade the severity of the abnormality. There is an azygous anterior cerebral artery (arrowhead, a), better demonstrated by MR angiography (arrowheads, c). It is characterized by the association of hypoplastic optic nerves and absent septum pellucidum. The clinical presentation is related to the association with either schizencephaly (presenting with seizures) or hypothalamic and pituitary hypoplasia (presenting with pituitary insufficiency). The diagnosis of septo-optic dysplasia is based on ophthalmoscopy, showing hypoplastic optic discs, and an MR picture of small optic nerves and chiasm and absent septum pellucidum (Fig. 11.8). The association with schizencephaly must be accurately scrutinized. 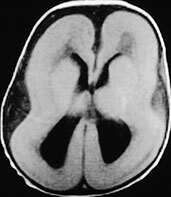 The anterior recess of the third ventricle and the suprasellar cistern may be widened due to hypoplasia of the optic chiasm, infundibulum, and pituitary gland, whereas the frontal horns show a square-like shape due to the absence of the septum pellucidum, a feature in common with lobar holoprosencephaly 17, 18, 20. Fig. 11.8 Septo-optic dysplasia, 7-month-old patient. (a) Axial CT scan; (b–f) MR at 1.5 T; (b) axial SE T1 weighted image, 600/16/2; (c) axial FSE T2 weighted image, 4500/112/2; (d) coronal SE T1 weighted image, 600/16/2; e) coronal FSE T2 weighted image, 4500/112/2; (f) sagittal SE T1 weighted image, 500/16/2. Both optic nerves are markedly thin (arrowheads, a). The septum pellucidum is absent (b–e). 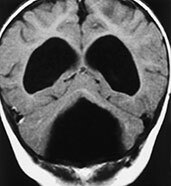 Several schizencephalic clefts are recognizable in both cerebral hemispheres. Scattered calcified foci in the white matter are depicted as hyperintense spots in T1 weighted images (b). 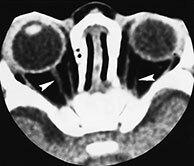 In coronal views, the frontal horns are square-shaped due to the absence of the septum pellucidum; the anterior pillars of the fornix are fused in this particular case (arrow, d). More posteriorly (e), two open-lipped schizencephalic clefts bordered by dysplastic cortex are detected. In a mid-sagittal view, the optic chiasm is hypoplastic (arrow, f), whereas the pituitary stalk is not visualized. At the 28th–37th gestational day, the thin roof of the rhombencephalon is formed by an ependymal membrane coated by pia mater. The plica choroidea, a precursor of the future choroid plexus, divides the rhombencephalic roof in two portions: the anterior membranous area (AMA) lying cephalad, and the posterior membranous area (PMA) lying caudad. The edges of AMA thicken progressively by cellular proliferation, forming the rhombic lips. These paired structures approach each other until they eventually fuse in the mid-line to form the vermis; the intervening AMA progressively involutes until its remnants are incorporated in the choroid plexus. Meanwhile, the PMA shows a transient posterior finger-like expansion, the Blake’s pouch, which will then disappear as the foramen of Magendie opens18. Cerebellar malformations derive from an inbalance between the formation of the rhombic lips and of the choroid plexuses at one side, and the involution of the AMA and PMA at the other18. A further categorization distinguishes cystic malformations, in which a CSF collection of variable nature is found within the posterior cranial fossa, and non-cystic malformations, which are usually dominated by vermian dysgenesis18. The most important group of cystic malformations is the Dandy–Walker complex1, whose main differential diagnosis is with infratentorial arachnoid cysts (Table 11.4). This term was introduced by Barkovich to designate a group of cystic malformations of the cerebellum resulting from a defective development of the structures originating from the rhombencephalic roof that represent an embryological continuum1. A further categorization is possible based on the prevailing involvement of the AMA or PMA (Table 11.5)17, 18, 20. Because the AMA is the initiator of cerebellar development, anomalies of the AMA will be dominated by major vermian hypoplasia, whereas in anomalies of the PMA the cerebellum is grossly normal. In fact, persistence of part of the AMA in between the cerebellar hemispheres implies that the corresponding portion of the vermis does not form, while the AMA itself balloons into a cyst that is in fact a dilated fourth ventricle. The definition of DWM classically includes partial or complete vermian agenesis associated with hypoplastic cerebellar hemispheres, cystic dilatation of the fourth ventricle, and expansion of the posterior fossa associated with high insertion of the tentorium, torcular Herophili and transverse sinuses (Fig. 11.9)17, 18, 20. Vermian hypogenesis may be more or less severe; however, the hypoplastic superior vermis is constantly rotated in a counter-clockwise fashion, and often lies posterior to the quadrigeminal plate. Cerebellar hemispheres are also hypoplastic and abut the petrous ridges. As previously stated, the posterior fossa is occupied by a large cyst corresponding to a dilated fourth ventricle, while the cisterna magna, albeit present, is effaced. Hydrocephalus develops in up to 80% of untreated cases. The diagnosis of DWM is important for treatment and prognostic implications. In fact, shunting of the fourth ventricle allows re-expansion and growth of the cerebellar hemispheres in about 80% of cases, while hydrocephalus invariably disappears18. Fig. 11.9 Dandy–Walker malformation. A 3-day-old newborn with craniofacial dysmorphia, hypertelorism, palatoschisis and right parietal cephalocele. MR at 0.5 T. (a) Sagittal SE T1 weighted image, 500/20/2; (b,c) axial SE T1 weighted images, 600/20/2. The posterior fossa is larger than normal due to the presence of a cyst-like fourth ventricle (4V) (a,b), whose inferior tip protrudes into the foramen magnum (white arrow, a). The vermis (v) is hypoplastic and rotated in a counterclockwise fashion (a). The tentorium is elevated (empty arrow, a) so that the torcular comes to lie cranial to the lambda (so-called torcular-lambdoid inversion). Notice the scalloped profile of the occipital squama in the sagittal section (a). In the axial plane, the hypoplastic cerebellar hemispheres (h) are winged outward (b). The pons is hypoplastic (a). The third ventricle appears to communicate with a dilated interhemispheric fissure (c). 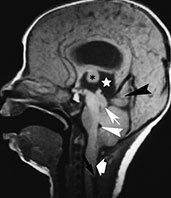 Associated malformations in this particular case include agenesis of the corpus callosum with the classical spokewheel-like arrangement of the mesial cortical sulci (a) and a right parietal cephalocele (arrowhead, c). In some cases, some key features of DWM, such as a rotated, hypoplastic vermis and a cystic dilatation of the fourth ventricle, may be found in patients with an essentially normal posterior fossa (Figs. 11.5, 11.6 and 11.1) The incidence of DWV is actually higher than that of the full-blown DWM, representing at least one-third of all cerebellar malformations1, 17, 18, 20. Probably, DWM and DWV represent two ends of the spectrum of AMA anomalies, with the main difference being in the degree of dilatation of the fourth ventricle and, therefore, of the posterior fossa. Fig. 11.10 Dandy–Walker variant, 26-day-old newborn. MR at 0.5 T. (a) Sagittal SE T1 weighted image, 544/16/3; (b) axial SE T1 weighted image, 573/16/3. 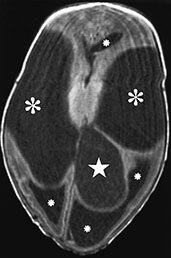 The fourth ventricle is dilated and the vermis is hypoplastic and rotated in a counterclockwise fashion; however, the global size of the posterior fossa is normal, different to what is found in the full-blown Dandy–Walker malformation. The cerebellar hemispheres are winged outward and displaced against the petrous ridges. The falx cerebelli is present (arrowhead, b). Supratentorial hydrocephalus is caused by concurrent aqueductal stenosis (arrow, a). 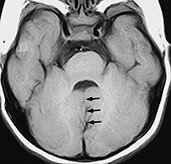 It is a common posterior fossa anomaly, secondary to evagination of the tela choroidea of the fourth ventricle and characterized by a sometimes marked dilatation of the cisterna magna which is, however, freely communicating with both the fourth ventricle and the adjacent subarachnoid spaces. The vermis and cerebellar hemispheres are normal or only mildly hypoplastic, and the fourth ventricle has normal shape and size (Fig. 11.11)19. 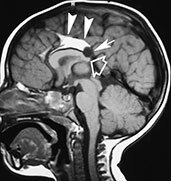 Hydrocephalus is never associated and the anomaly is constantly clinically silent, being usually encountered during MRI for other indications. Fig. 11.11 Mega cisterna magna. MR at 0.5 T. (a) Sagittal SE T1 weighted image, 500/20/4; (b) axial SE T1 weighted image, 500/20/4. There is dilatation of the cisterna magna (starlet, a,b). The vermis is normal, whereas the right cerebellar hemisphere is mildly hypoplastic (b). The CSF collection protrudes through a partially split tentorium (arrow, a). The fourth ventricle has a normal shape and there is no hydrocephalus. If the Blake’s pouch fails to regress, it may persist throughout childhood. 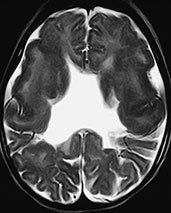 This anomaly is characterized by a retrocerebellar CSF collection communicating with a dilated and deformed fourth ventricle (Fig. 11.12). Because the foramen of Magendie never opens, CSF obstruction with tetraventricular hydrocephalus results. Shunting of the retrocerebellar pouch restores normal CSF outflow, so that both hydrocephalus and the pouch itself disappear19. Fig. 11.12 Persisting Blake’s pouch, 5-month-old infant. MR at 1.5 T. Sagittal FSE T2 weighted image, 4070/96/5. The Blake’s pouch (asterisk) widely communicates with a dilated fourth ventricle. 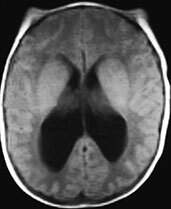 There is marked tetraventricular hydrocephalus. Turbulent CSF flow generates artifacts in the third ventricle, aqueduct, and fourth ventricle, seen as relative signal decay. The inferior vermis is compressed. A wide group of syndromes, some with a genetic background, fall into this heterogeneous group. Pathologically, they are mainly characterized by vermian dysgenesis. Only the main entities are discussed here. 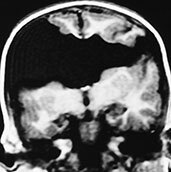 This rare abnormality is characterized by vermian agenesis, fused cerebellar hemispheres and peduncles, and apposed or fused dentate nuclei. MR detects the absence of the vermis and the mid-line fusion of the cerebellar hemispheres (Fig. 11.13)18. In axial MR images, the folia and sulci are continuous throughout the mid-line; in sagittal MR images, the structure lying in the mid-sagittal plane is not the vermis but a monolobated cerebellum. The posterior fossa is small and the fourth ventricle has a characteristic keyhole shape. Associated supratentorial abnormalities may be found. 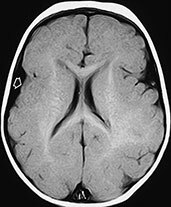 This rare abnormality is characterized by vermian hypo-aplasia, occipital cephalocele, and marked deformation of the quadrigeminal plate and brain stem. The colliculi are fused to form a ‘beak’ pointing towards the site of the cephalocele. On MR (Fig. 11.14)18, vermian hypo-aplasia is well depicted, and the tectal beak is visible both in the sagittal and axial planes. The cerebellar hemispheres usually tend to engulf the brain stem. Associated supratentorial anomalies and hydrocephalus are common findings. This anomaly should probably be classified as a particular form of neural tube closure defect associated with vermian agenesis. This entity typically presents clinically in the neonatal age with hyperpneic–apneic spells, ataxia, nystagmus and developmental delay. The inheritance is autosomal recessive. Pathologically, vermian dysgenesis is the key feature. Absence of the pyramidal decussation and medullary olivary nuclei is often associated. On MR (Fig. 11.15)18, the vermis is completely or partially absent with only the anterior lobules visible. The fourth ventricle is high-riding and has an umbrella shape in axial images, whereas its roof is convex superiorly in sagittal images. The superior cerebellar peduncles are elongated, thin, and project straight back, running parallel with each other. 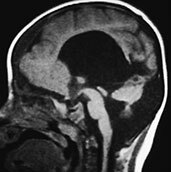 An occipital cephalocele is present in 30% of cases. Fig. 11.13 Rhombencephalosynapsis, 9-year-old patient with truncal ataxia and psychomotor delay. MR at 0.5 T. (a) Axial SE IR image, 2000/20/1 with T1 150ms; (b) axial SE T1 weighted image, 500/20/2; (c) sagittal SE T1 weighted image, 500/20/2; (d) coronal SE T1 weighted image, 500/20/2. The posterior fossa is small. Cerebellar convolutions are orientated transversely and the white matter is continuous across the mid-line (a,b). The tonsils and the vallecula are not visible (b,d). On a mid-sagittal section (c), the ‘vermis’ is actually a mid-line cut through the monolobated cerebellum, whose fissures are clearly visible (c). Fig. 11.14 Tectocerebellar dysraphism. Patient operated for small occipital cephalocele containing cerebellar tissue. MR at 0.5 T. (a,b) Sagittal SE T1 weighted images, 500/20/2; (c) axial SE T1 weighted image, 600/20/2; (d) coronal SE T1 weighted image, 500/20/2. The brain stem is markedly distorted and stretched towards the cephalocele site (thick arrow, a); the corpus callosum is thin, and the mammillary bodies are hypoplastic (arrow, b). The mesial cortex is diffusely arranged into multiple small gyri (stenogyria) (a). There is extreme beaking of the quadrigeminal plate (thin arrows, a,c). The vermis is agenetic, and the two cerebellar hemispheres face one another at the mid-line (arrowheads, d). The falx cerebri is fenestrated, resulting in interdigitation of gyri across the interhemispheric fissure (arrows, d). Fig. 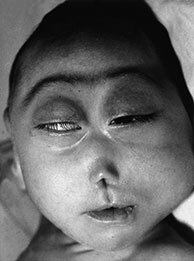 11.15 Joubert syndrome, 23-month-old infant. MR at 1.5 T. (a) Sagittal SE T1 weighted image, 500/14/2; (b) axial SE T1 weighted image, 437/16/2; (c) axial SE IR image, 2500/30/1 with T1 150ms. 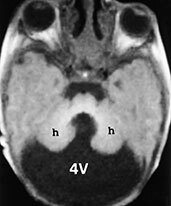 The vermis (v) is partially agenetic, and the cerebellar hemispheres (h) are seen as they abut one another at the mid-line (a). There is concurrent callosal dysgenesis with absence of the splenium and genu. Axial sections show the cleft between the two adjoining cerebellar hemispheres (arrows, b) and the resulting umbrella-like fourth ventricle. On a slightly higher section, the two hypoplastic superior cerebellar peduncles project straight back, running parallel to each other (arrowheads, c). The complex events leading to the formation of the cerebral cortex may be simplified in three main steps: proliferation, migration and organization15. Proliferation begins during the 7th gestational week, when cells in the subependymal layer of the walls of the lateral ventricles form the germinal matrix. During the following weeks, neurons generated by intense mitotic activity in the germinal matrix begin to migrate radially towards the surface of the brain; such migration follows a track laid by specialized radial glial fibers. There is a 1:1 correspondence between the site of cell proliferation within the germinal matrix and its eventual location within the cortical plate. It is not clear at what time migration in the cortex of the human fetus stops. However, distal processes of the radial glia disappear by 20–28 weeks’ gestation, suggesting no or little migration on glial guides at this stage15. Organization of the cortex to the eventual six-layer configuration occurs next, and is completed by the 7th lunar month15. The current classification6 categorizes cortical malformations in defects of proliferation, migration, and organization (Table 11.6). However, the terminology used to describe these anomalies is still not uniform, and there is a tendency to employ different terms to describe malformations which are in fact identical in clinical, histological and neuroradiological terms. According to the current classification6, this anomaly results from a disorder in neuronal and glial proliferation in the germinal matrix. It may be isolated or occur in patients with neurocutaneous syndromes such as the Klippel– Trenaunay–Weber syndrome, linear nevus sebaceous syndrome, hypomelanosis of Ito, neurofibromatosis type 1, and Proteus syndrome20. MR shows enlargement of a whole hemisphere (Fig. 11.16). The cortex is affected by diffuse migration anomalies, while the white matter is gliotic and dysmyelinated. The ipsilateral ventricle is frequently dilated and the frontal horn is stretched. The homolateral cerebellar hemisphere is usually enlarged as well. Affected newborns suffer from untreatable epilepsy, so that hemispherectomy is often necessary. However, because hemispherectomy is contraindicated if the contralateral hemisphere has cortical malformations, assessment of the contralateral hemisphere is crucial. 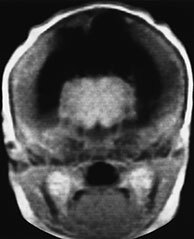 The term lissencephaly refers to a complete lack of sulcation of the cortical plate and should therefore be considered synonymous with agyria, whereas pachygyria indicates few, broad gyri with shallow sulci5. However, there is a wide spectrum of intermediate features in which variably combined areas of agyria and pachygyria co-exist; this may validate the use of the term agyria–pachygyria complex6. Embryologically, the anomaly results from diffusely abnormal neuronal migration. 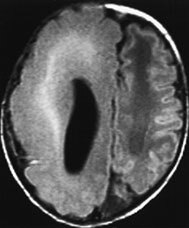 Type 1 (classical) lissencephaly is usually found in children with Miller–Dieker syndrome (caused by partial deletion of chromosome 17), but some patients have X-linked lissencephaly; histologically, there is a four-layered cortex with a thick sparse cell layer interposed between the external and internal cellular layers. On MR (Fig. 11.17)17, 18, 20, the cortical surface is flat and the Sylvian cisterns are broad and vertically oriented; therefore, the brain has a figure-of-eight shape in axial sections. The cortex is thickened and the hyperintense sparse cell layer is usually visualized. Fig. 11.17 Type 1 (classical) lissencephaly. A 13-day-old newborn with Miller–Dieker syndrome. 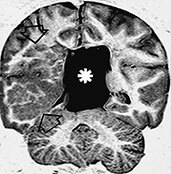 MR at 0.5 T. (a) Axial SE T2 weighted image, 2000/90/1; (b) axial SE T1 weighted image, 600/20/2; (c) coronal SE T1 weighted image, 600/20/2; (d) sagittal SE T1 weighted image, 500/20/2. The brain has a figure-of-eight shape in the axial plane (a,b) and a ‘chicken brain’ shape in the coronal plane (c). 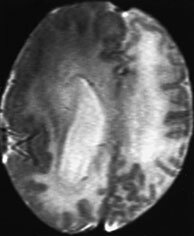 The surface of the brain is flat due to the lack of sulcation, and the Sylvian fissures are shallow and vertically oriented. The cortex is markedly thickened, and a hyperintense band corresponding to the sparse cell layer is clearly visible in T2 weighted images (arrows, a). There is also marked callosal hypoplasia (d). 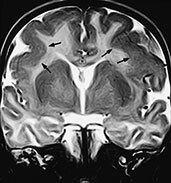 Band heterotopia is presently categorized as a particular subset within the type 1 X-linked lissencephaly group6; in this entity, the majority of radial glial fibers are damaged, manifesting with bilateral, thick layers of arrested neurons located approximately half-way between the ventricles and the cortical plate, resembling a doubling of the cortex (Fig. 11.18)17, 18, 20. 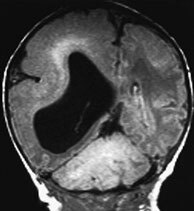 Type 2 (cobblestone) lissencephaly is usually found in children with Fukuyama congenital muscular dystrophy, Walker–Warburg syndrome, and muscle–eye–brain disease. There is a more anarchic disorganization of the cortex, with zones of typical lissencephaly interspersed among areas of polymicrogyria. Cortical lamination is absent and subcortical heterotopia may be found. On MR (Fig. 11.19), the cortex is thinner than in type 1, and there may be concurrent hypomyelination of the white matter5. Fig. 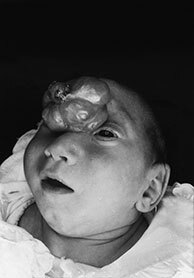 11.19 Type 2 (cobblestone) lissencephaly, 6-month-old female with muscle-eye-brain disease. MR at 1.5 T. (a,b) Axial FSE T2 weighted image, 4500/108/4; (c) sagittal T1 weighted image, 500/12.5/2. There is cortical thickening with abnormal gyri and shallow sulci in the frontal lobes (arrowheads, b); the cortex shows a bumpy surface and is less markedly thickened than in type I lissencephaly. The underlying white matter is abnormally hyperintense due to abnormal myelination; also the paratrigonal white matter shows the same features. 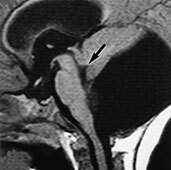 In the posterior fossa cerebellar cortical dysgenesis is revealed by the bumpy surface of both hemispheres and multiple subcortical cysts (arrows, a) There is also hypoplasia of the pons (arrow, c) and inferior vermis with concurrent cisterna magna. Damage of radial glial fibers may arrest neuronal migration at anomalous sites, where neurons conglomerate in a disorganized fashion. Patients almost always present with a seizure disorder. 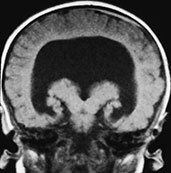 Gray matter heterotopia may be subependymal, subcortical or meningeal, whereas band heterotopia is presently classified among the lissencephalies (see above). 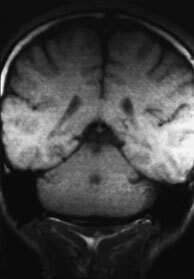 In all cases, heterotopia is isointense with normal gray matter in all MR sequences. Subependymal heterotopia is more common, and may in turn be focal or diffuse; focal nodules are found as sporadic cases (Fig. 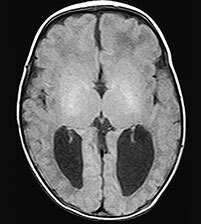 11.20), whereas diffuse heterotopia bordering the walls of the lateral ventricles are more likely to be X-linked3. Subcortical heterotopia is less frequent (Fig. 11.19). In other cases, radial glial fibers may develop excessively, resulting in neuronal overmigration; eventually, neurons come to lie within the meninges (marginal glio-neuronal heterotopia)18. Fig. 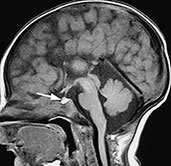 11.20 Subependymal heterotopia, 28-month-old child with Chiari II malformation. MR at 1.5 T. (a) Axial SE T1 weighted image, 500/16/2; (b) axial FSE T2 weighted image, 4000/96/2. There is a subependymal heterotopic nodule in the lateral wall of right frontal horn (white arrow, a,b). The nodule is isointense with gray matter both in T1 and T2 weighted images. Notice abnormal configuration of the lateral ventricles in this Chiari II patient and the presence of a shunt catheter (black arrow, b). 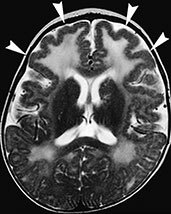 The term cortical dysplasia has been widely used in the neuroradiological literature to refer to diffuse, focal, and mono-bilateral cortical anomalies whose ultimate categorization as polymicrogyria or agyria–pachyigyria was difficult by means of MR alone. With the advent of more refined MR technology and the tumultuous development in the understanding of normal and abnormal cortical development, it has become apparent that focal cortical dysplasias (FCD) exist as autonomous malformations and that their differentiation from both polymicrogyria and agyria–pachygyria is feasible by MR. However, not every problem has been solved, and a certain degree of confusion probably still exists; this is mainly due to the fact that different types of FCD have been identified histologically and that these different varieties result from abnormalities occurring in different steps of neuronal development9. The main entities that are discussed here are Taylor type FCD (FCD with balloon cells) and FCD without balloon cells. FCD with balloon cells (Taylor type FCD) is presently classified among proliferation disorders. 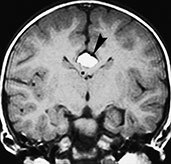 According to Barkovich2, this abnormality is coincidental with focal transmantle cortical dysplasia; however, we have seen cases in which the abnormality did not involve the whole cerebral mantle thickness, and we therefore believe that there is a spectrum of abnormality ranging from restricted cortical involvement to transmantle abnormalities, in which abnormal cells extend along the full thickness of a hemisphere (from the subependymal layer to the brain surface). Histologically, both atypical neurons and glial are found, and balloon cells (large cells with abundant eosinophilic cytoplasm, showing intermediate features between neuronal and glial elements) are consistently present. On MR (Fig. 11.21), there is an abnormal gyral pattern in the involved region. 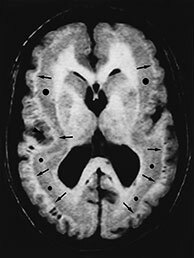 The abnormal tissue may extend radially inwards to the ventricular surface, and typically shows mixed signal intensity, with areas that are isointense to gray matter and other areas isointense to white matter. The underlying white matter is hyperintense in T2 weighted images9. The gray–white matter interface is blurred. FCD without balloon cells or microdysgenesis is characterized histologically by abnormal cortical lamination without the presence of balloon cells. It is presently categorized among disorders of cortical organization. Affected children almost always present with complex partial seizures. MR scans may be deceptively normal; however, focal atrophy in the affected areas has been described in the majority of cases9. Fig. 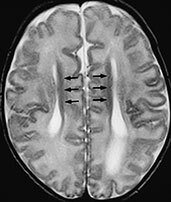 11.21 Focal cortical dysplasia with balloon cells (focal transmantle cortica dysplasia), 24-month-old patient with status epilepticus. MR at 1.5 T. (a) Axial FSE IR image, 8024/80/2 with TI 150†ms; (b) coronal FSE IR image, 8024/80/2 with TI 150†ms. There is a giant conglomerate of heterotopic nodules with interspersed white matter in the right cerebral hemisphere extending from the ependymal to the brain surfaces (empty arrows, a,b). There also is concurrent interhemispheric cyst (asterisks, a,b). Polymicrogyria is the most frequent cause of partial epilepsy in the pediatric age5. Strictly speaking, polymicrogyria is a histological diagnosis. 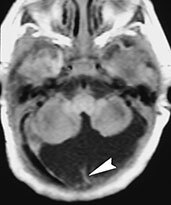 In polymicrogyria, the causal insult produces selective laminar necrosis of layer 5, resulting in excessive infolding of the cortex with thin, numerous microconvolutions separated by narrow and often obliterated sulci. The insult occurs after the end of neuronal migration, that is in the phase of cortical organization. 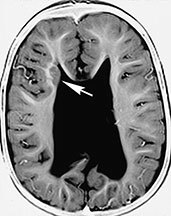 Polymicrogyria may be unilateral or bilateral (congenital bilateral perisylvian syndrome); in the latter case, both Sylvian fissures are maldeveloped and lined by dysplastic cortex, frequently extending to the perirolandic regions. Clinically, this anomaly presents with congenital Foix–Chavany–Marie syndrome (facio-pharyngo-glosso-masticatory diplegia or diparesis)7. Bilateral polymicrogyria may also involve the frontal, occipital and temporal lobes. Because genetic as well as acquired (cytomegalovirus infection, in utero ischemia) causes may result in polymicrogyria, this abnormality represents a sort of watershed between true malformations and destructive events. On MR (Fig. 11.22), polymicrogyria appears as an area of increased cortical thickness and may therefore mimic pachygyria when thick sections are acquired; thin cuts reveal that the abnormality is composed of multiple, small gyri. The gray–white matter junction is generally irregular, whereas the cortical surface may be flat or extend inward, producing a cortical infolding around an abnormally oriented sulcus. 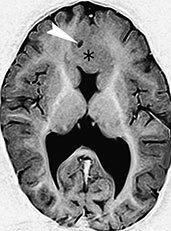 The abnormal cortex itself is isointense to normal gray matter, whereas the underlying white matter may show T2 prolongation; in these cases, the differentiation from Taylor’s type focal cortical dysplasia is possible only by means of histology. 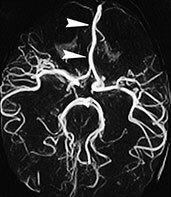 Anomalous venous drainage is common in dysplastic cortical areas, and large veins may often be seen within the abnormal sulci. Fig. 11.22 Polymicrogyria, 8-month-old infant with connatal cytomegalovirus infection. MR at 1.5 T. (a) Axial SE T1 weighted image, 700/16/2; (b) axial FSE T2 weighted image, 4500/112/2; (c) coronal FSE T2 weighted image, 4500/112/2. 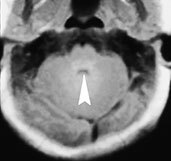 A shallow Sylvian fissure is visible in T1 weighted images (empty arrow, a). T2 weighted images are better suited to depict the cortical anomaly by detecting bilateral thickening of the brain cortex (arrows, b,c). A few broad, shallow sulci are visible in the anomalous area. Schizencephaly is characterized by a cleft extending through the whole hemisphere, from the ependymal lining of the lateral ventricle to the pia covering the brain. 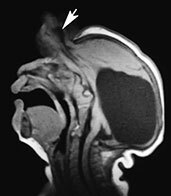 The cleft may be uni- or bilateral and is constantly lined by polymicrogyric cortex; as a consequence, schizencephaly may be viewed as an extreme of the spectrum of polymicrogyria, in which the cortical infolding reaches the lateral ventricle. The genetic nature of schizencephaly has been proved recently8, and the traditional clastic theory has been dismissed. The walls of the cleft may be widely separated (open lips); in this case, the cleft is occupied by CSF and the anomaly is easily detected by MR (Fig. 11.23). When the walls abut one another (fused lips), the cleft may not be easily visible; however, a dimple may be seen in the wall of the lateral ventricle where the cleft communicates (Fig. 11.24). 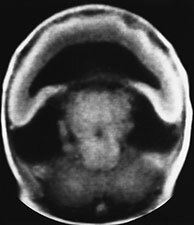 In all cases, the detection of the dysplastic cortex lining the cleft is essential in order to distinguish schizencephaly from a porencephalic cavity4, 17, 18, 20. Fig. 11.24 Fused lips schizencephaly, 3-year-old patient. 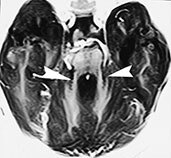 (a) Axial CT scan; (b) MR at 0.5 T, coronal SE T1 weighted image, 500/20/2. Both CT and MR adequately depict the presence of cortex bordering the cleft. A dimple along the lateral wall of the right lateral ventricle is visible in the coronal section (arrow, b), and correspondes to the opening of the schizencephalic cleft. The opening on the brain surface is best seen in the CT image in this particular case (a). Contrary to what the term might suggest, this anomaly is not related with Chiari II or III malformations except for the name of Dr H. Chiari, who first described these entities in 189118. 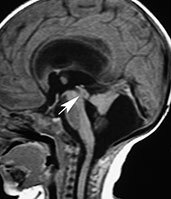 The Chiari I malformation is characterized by bilateral or, less frequently, unilateral ectopia of the cerebellar tonsils into the foramen magnum (Fig. 11.25). The posterior fossa is generally normal, and the vermis is normally shaped and located. Associated hydrocephalus and hydromyelia are frequent, and may be secondary to restricted CSF flow at the level of the crowded foramen magnum18. 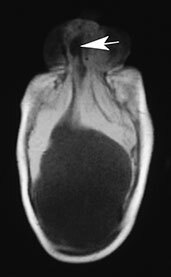 In rare cases, the medulla oblongata is dysmorphic, thickened in the sagittal plane, and shows a prominent obex. 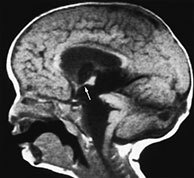 This associated feature depicts a myelencephalic variant of Chiari I as opposed to the classical form, in which the medulla, albeit stretched caudally, is otherwise normal17, 18, 20. Patients with Chiari I malformation may be asymptomatic or present with headache, torticollis, cervical pain and cranial nerves palsies. 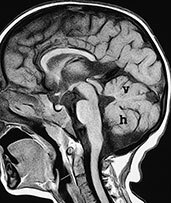 When suspecting a Chiari I malformation, other causes of cerebellar tonsils herniation (especially acute intracranial hypertension) must be ruled out. In addition, all patients with Chiari I should undergo spinal MR in order to detect hydromyelia. The reverse is also true in that all cases of unexplained hydromyelia should be scrutinized for an associated Chiari I. Fig. 11.25 Chiari I malformation, 18-day-old newborn. MR at 1.5 T. (a) Sagittal SE T1 weighted image, 600/16/2; (b) Coronal SE T1 weighted image, 591/16/2. The ectopic tonsils (thin black arrows, a,b) lie posterior to the medulla–cord junction. The brain stem is normal. 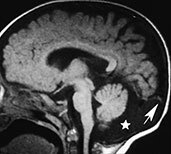 Notice diffusely hyperintense pituitary gland (large black arrow, a), a typical finding in the neonate. 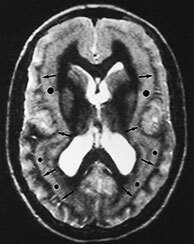 Their commonest location is in the deep interhemispheric fissure (so called lipomas of the corpus callosum), where they are almost consistently associated with commissural plate abnormalities, but they may also be located in the quadrigeminal plate, suprasellar, interpeduncular, cerebellopontine angle and Sylvian cisterns18. Lipomas are not tumors, but true malformations of the meninx primitiva, abnormally differentiating into fatty tissue. They are almost always mid-line in location and lie in the subarachnoid spaces. MR depicts lipomas as hyperintense masses on T1 weighted images, becoming hypointense on T2 weighted images as TE increases, except for FSE-T2 weighted images, where they remain hyperintense (Fig. 11.26). Signal intensity in both T1 and T2 weighted images is nulled when fat saturation pulses are applied. Large lipomas will show the chemical shift artifact. Pericallosal lipomas are subdivided according to morphology into curvilinear and tubulonodular varieties10: the former is thinner, has a more or less linear morphology, and lies usually along the callosal body and splenium (Fig. 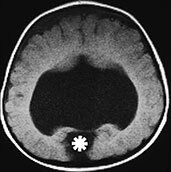 11.26), whereas the latter is found along the anterior corpus callosum, is bulkier, and has a higher incidence of calcifications. Arachnoid cysts are CSF-filled cavities coated by a membrane made of arachnoid–neurothelial tissue which may secrete fluid, as do normal arachnoid villi. Although the pathogenesis of these malformations is still incompletely understood, they could result from anomalous differentiation of the leptomeninges, a process occurring between the 6th and 8th gestational weeks. 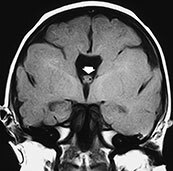 Arachnoid cysts are more frequently supratentorial (about 75% of cases) (Fig. 11.27), particularly at the temporal poles13. Other relatively common locations include the posterior fossa (Fig. 11.28) and the suprasellar and quadrigeminal cisterns (Table 11.7). MR (Figs. 11.27 and 11.28) depicts arachnoid cysts as round to oval masses with signal intensity paralleling that of CSF, although increased protein content in excluded cysts may shorten T1 and increase T2. CSF pulsation tends to slowly but progressively enlarge the cyst, producing a certain degree of mass effect and even a deformation of the skull in some cases. Although the diagnosis is usually relatively straightforward, arachnoid cysts in the posterior fossa require careful differentiation with other cystic malformation belonging to the Dandy–Walker complex (Table 11.4). Fig. 11.27 Multiple supratentorial arachnoid cysts, 3-day-old newborn with macrocrania. MR at 0.5 T. (a) Axial SE T1 weighted image, 600/16/2; (b) coronal SE T1 weighted image, 600/16/2; (c,d) sagittal SE T1 weighted images, 600/16/2. Two large temporal cysts (large asterisks, añd) and a bilobate left interhemispheric cyst (starlets, añd) are detected. The latter is slightly higher intensity, probably due to higher protein content. The ventricular system is in part dilated (small asterisks, añd). 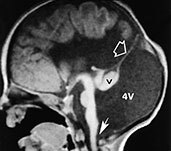 Notice the uniformly hyperintense pituitary gland (arrow, c), a typical finding in the newborn. Fig. 11.28 Retrocerebellar arachnoid cyst, 21-month-old infant. MR at 0.5 T. (a) Sagittal SE T1 weighted image, 600/20/2; (b) coronal SE T1 weighted image, 600/20/2; (c) axial FSE T2 weighted image, 3500/90/2. This huge cyst splays the cerebellar hemispheres and displaces the vermis superiorly. 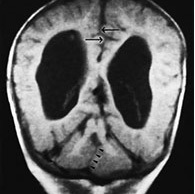 On axial sections this arachnoid cyst could be mistaken for a DandyñWalker malformation, but the mid-sagittal section clearly shows a normally developed, albeit compressed, fourth ventricle (arrow, a). There is marked triventricular hydrocephalus. 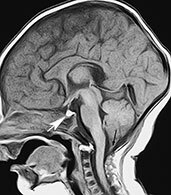 MRI provides detailed multiplanar imaging which is essential for identifying congenital malformations. A knowledge of normal brain development is essential for correctly identifying abnormalities. 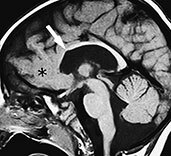 The classification of congenital malformations is continually changing with new insights into brain development. As the genetics of congenital malformations becomes more complex MRI can provide important information on specific brain phenotypes. Altman NR, Naidich TP and Braffman BH (1992) Posterior fossa malformations. 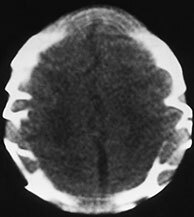 Am J Neuroradiol 13, 691–724. Barkovich AJ (2000) Pediatric Neuroimaging, 3rd edn. Philadelphia, Lippincott Williams & Wilkins, pp. 281–318. Barkovich AJ and Kjos BO (1992) Gray matter heterotopias: MR characteristics and correlation with developmental and neurological manifestations. Radiology 182, 483–489. Barkovich AJ and Kjos BO (1992) Schizencephaly: correlation of clinical findings with MR characteristics. 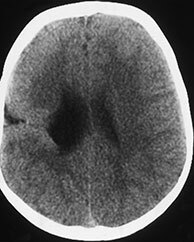 Am J Neuroradiol 13, 85–94. Barkovich AJ, Gressens P and Evrard P (1992) Formation, maturation, and disorders of brain neocortex. Am J Neuroradiol 13, 423–446. Barkovich AJ, Kuzniecky RI, Dobyns WB et al. (1996) A classification scheme for malformations of cortical development. Neuropediatrics 27, 59–63. Cama A, Tortori-Donati P, Piatelli GL et al. (1995) Chiari complex in children. Neuroradiological diagnosis, neurosurgical treatment and proposal of a new classification (312 cases). Eur J Pediatr Surg 5 (Suppl 1), 35–38. Capra V, De Marco P, Moroni A et al. (1996) Schizencephaly: surgical features and new molecular genetic results. Eur J Pediatr Surg 6 (Suppl 1), 27–29. Colombo N, Tassi L, Galli C et al. (1998) Malformations of cortical development. Clinical-neuroradiologic correlations in 38 patients. Bull Lega It Epil 102/103, 17–28. Kash F, Brown G, Smirniotopoulos JA et al. 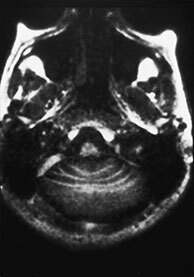 (1996) Intracranial lipomas. Pathology and imaging spectrum. Int J Neuroradiol 2, 109–116. McLone DG and Knepper PA (1989) The cause of Chiari II malformation: a unified theory. Pediatr Neurosci 15, 1–12. Naidich TP, McLone DG and Fulling KH (1983) The Chiari II malformation. Part IV. The hindbrain deformity. Neuroradiology 25, 179–197. Naidich TP, McLone DG and Radkowski MA (1986) Intracranial arachnoid cysts. Pediatr Neurosci 12, 112–122. Naidich TP, Altman NR, Braffman BH et al. (1992) Cephaloceles and related malformations. 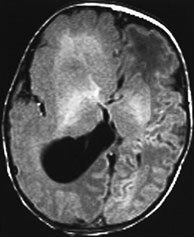 Am J Neuroradiol 13, 655–690. Norman MG, McGillivray BC, Kalousek DK et al. (1995) Congenital Malformations of the Brain. Pathological, Embryological, Clinical, Radiological and Genetic Aspects. New York, Oxford University Press. Raybaud C and Girard N (1998) Étude anatomique par IRM des agénésies et dysplasies commissurales télencéphaliques (agénésies du corps calleux et anomalies apparentées). Corrélations cliniques et interprétation morphogénétique. Neurochirurgie 44 (Suppl 1), 38–60. 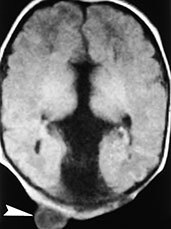 Tortori-Donati P (http://medic-online.net/mr/tortori-donati/) (1996–1998) MRI – Congenital brain malformations. In: Passariello R et al. (Eds) (http://medic-online.net/mr/) Magnetic Resonance in Medicine Multimedia Virtual Textbook. Luxembourg S:A.
Tortori-Donati P, Taccone A and Longo M (Eds) (1996) Malformazioni Cranio-encefaliche. Neuroradiologia. Torino, Minerva Medica. Tortori-Donati P, Fondelli MP, Rossi A et al. 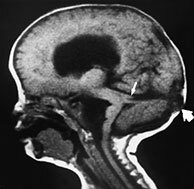 (1996) Posterior fossa malformations originating from a defect of the posterior membranous area. Mega cisterna magna and persisting Blake’s pouch: two separate entities. Child’s Nerv Syst 12, 303–308. Tortori-Donati P, Fondelli MP and Rossi A (1998) Anomalie congenite. In: Simonetti G, Del Maschio A, Bartolozzi C et al. (Eds) Trattato Italiano di Risonanza Magnetica, Vol. 1. Naples, Gnocchi-Idelson, pp. 155–203. Van Allen MI, Kalousek DK, Chernoff GF et al. (1993) Evidence for multisite closure of the neural tube in humans. Am J Med Genet 47, 723–743.